1. Breathe Fresh Air: It’s time to get outside and take joy in nature as it comes to life after the winter temperatures. 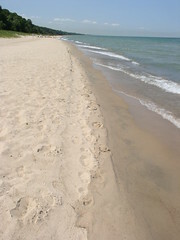 Warren Dunes State Park, Warren Woods, Chikaming Township Park & Preserve and Firefly Resort’s private beach are perfect for walking, hiking or just enjoying nature. 2. Cast Your Hook: In Harbor Country you can charter a boat for a Lake Michigan fishing excursion or try your luck off the Galien River Bridge with your fishing buddies. 3. Travel the Wine Trail: There are 11 wineries and several tasting rooms along the Lake Michigan Shore Wine Trail. Indulge in an afternoon or evening of wine tasting and decide which local wine is your favorite. 4. Enjoy the Arts: From open mic nights to musical performances, you can’t beat live entertainment. The Acorn Theater in Three Oaks has great Thursday Night programs. 5. Shop ‘Til You Drop: Whether you enjoy antiquing, art galleries or boutiques, Harbor Country has it all. Even though the weather was cold for a spring getaway, I recently explored Harbor Country with a relaxing stay at Firefly Resort. Before heading to the cottage, I stopped at the Harbert Antique Mall to do a little shopping. I picked up a beautiful pair of wooden candlestick holders and two vintage postcards for my collection. Next stop was the Firefly Resort cottage to refresh before lunch. This was my first stay at Firefly Resort and I must admit that I was pleasantly surprised. As cute as the cottages are on the outside, the inside is even more charming! The cottage I stayed in (Unit #9) had beautiful wainscoting and cream-colored walls in both the living room and bedroom. The bathroom had calming green walls with the cutest beach decor. 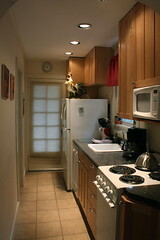 The kitchen was stocked with dishes, glasses and cooking essentials. I immediately wished that my stay was longer than just a weekend because this kitchen would be such a benefit to longer stays, especially during the summer or fall. One of the best features, in my opinion, was the cozy screened-in back porch. 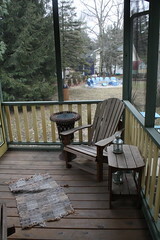 There were two Adirondack chairs and a side table. I could imagine sitting out there in the evenings, relaxing in the summer breeze. After freshening up, it was time for lunch. I went to Redamak’s, known for the “Hamburger that made New Buffalo famous.” They had just opened for the season and even though there were a lot of people there for lunch, the service was good and the food was delicious. I continued south to downtown New Buffalo for a little more shopping and a quick stop at the beach. I headed back to the cottage for a little down time and then selected El Rancho Grande for dinner. Their posole soup hit the spot on that cold evening. After a great night in my cottage, I started the next day with a walk down to the private beach, just a short walk from the cottage. I didn’t want this weekend to end so I stopped at Millie’s Antiques before heading back to the city. If you love vintage kitchen accessories, dishes and cookware, this is the shop for you! I instantly fell in love with several items. It was the perfect end to the perfect weekend. I can’t wait to come back to Firefly Resort again to further explore the beach, shops and everything else that I couldn’t fit in on this trip! You are currently browsing the FireFly Resort blog archives for April, 2011.